Akit's Complaint Department: Muni Considers Ending BART Plus Relationship - Another Nail in the Coffin? Muni Considers Ending BART Plus Relationship - Another Nail in the Coffin? Last week Friday, the SFMTA had a hearing to consider ending Muni's relationship in the BART Plus program. While this is not yet official, it would still have to go under the Board of Directors for a final vote. BART Plus is a combination of a BART ticket with privileges to ride neighboring public transit agencies (a flash pass). The ticket has varying price points and is sold on a twice monthly basis with the "A" and "B" tickets valid for the first fifteen days and the last fourteen to sixteen days. Passengers using BART Plus gets some nice perks: The 'last ride' bonus will let passengers with less than enough credit on their BART ticket funds get to ride one last time regardless of how much the fare is; the ticket is returned to the passenger so it can be used as a flash pass. The flash pass portion is valid with multiple transit agencies as a local fare credit. The biggest hit to BART Plus was the end of acceptance on AC Transit in 2003; a major connection for BART passengers within the East Bay. The only discount BART and AC Transit passengers receives today is the 25 cent discount when transferring from BART to AC and vice versa using a Clipper card. Muni is one of the busiest transit agencies in the entire Bay Area, especially when comparing the high number of passes sold every month versus other agencies that operates in larger counties. BART Plus and Muni plays a vital role for passengers to save money while being able to commute just using one ticket. This is especially true for passengers that may have to ride more than just Muni and BART to get to work by combining everything into one. BART Plus can never convert to Clipper until all the agencies under the Plus ticket can have Clipper card readers installed, so the old fashioned ticket will still be in existence. Muni claims that they have to end their relationship because of the agency's goal to end paper passes and convert everything into Clipper. BART Plus is the first of its kind to be a multi-agency transit pass integrated with BART access. If you are to compare other agencies with their pass agreements, the second best is Caltrain with their 2+ zone monthly pass giving passengers access to Samtrans and VTA at no extra charge, and an optional discounted Muni pass. Other agency agreements like Muni's "A" pass only gives Muni passengers access to BART. It's been the MTC's dream for a Clipper card monthly pass that can access ALL transit agencies for one flat price, but that dream may never come to fruition because of the numerous transit agencies running in the Bay Area. BART Plus' old agreements makes that dream real for passengers and saves them tons of money to get around the Bay Area with relative ease, even though it's not compatible with the Clipper card. Ending Muni's relationship will be a major setback for BART Plus. 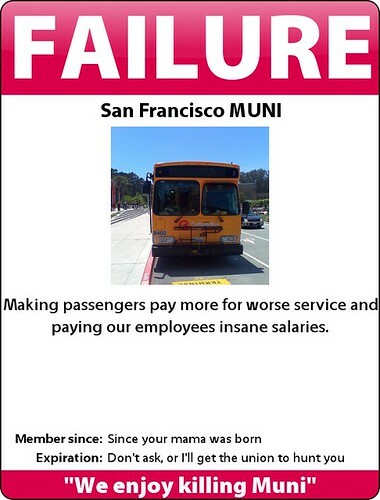 Losing AC Transit was bad enough, but Muni may kill BART Plus, or at least put another nail in the coffin. I think Muni's statement about trying to end all paper passes is a bunch of junk; they will make plenty of BART Plus passengers angry and the public knows Muni is being greedy by asking for people to fork over more money. Why can't we all just get along with each other? The Bay Area transit agencies should be playing nice with each other with generous transfer and pass agreements making it easier for everyone to ride one agency to another. Instead, each one wants to be Mr. Tough Guy and force us passengers to pay more. A lot of the transfer agreements is a bunch of crap; 25 cents here, 50 cents there; it's not much. Caltrain, Samtrans, and VTA have a really cool transfer agreement for those who rides Caltrain with 2+ zone monthly pass, so why can't other agencies work on an decent agreement that works for their passengers? Lastly, here's a reason why the Clipper card goes through so much hell and is probably one of the most complicated fare card systems in the entire nation or possibly the world; each individual transit agency has their own fare rules, transfer rules, inter-agency rules, and pass rules that makes it so much more difficult for tourists or possibly the average citizen to understand. The MTC made one huge mistake: They allowed the Clipper card to absorb the grandfathered rules that makes no sense, such as the 8-ride Caltrain ticket, instead of working on better solutions like changing it to a 10-ride or an across the board 50 cent fare discount whenever you transfer between one agency. Maybe if transit agencies played nice with each other, they can help get more cars off the road, and with increasing passenger loads, show to the state and federal governments that they need more funding to meet demand so more buses and trains can be operating. In all honesty, Clipper has ultimately killed BART Plus, what turns people off from the BART Plus, in my opinion, is that they have to buy the A and B pass every month, every 15/16 days. I used BART+ for a long time when I commute to Emervyille from SF. Yes, it was a pain having to stop at the machine every 2 weeks to buy the next pass, but it was a big savings. I even sometimes used it while commuting to Mountain View. During baseball season, I would transfer northbound at Millbrae to BART to get off very crowded trains. But once Clipper came in, it became more complicated and required trips to different places to buy my fare so I gave it up. While Seattle (Puget Sound) has Puget Pass, the Bay Area should have a "Bay Pass." Puget Pass price varies, it costs 36 times of the base fare of your choice. For example, a $2 ride value pass would cost $72, available on ORCA only. The best part is, transferring between systems only require paying the difference. This includes transferring from bus to train. I can literally ride the connecting bus for free if I paid my rail fare with ORCA, and it works both ways. And not to mention fare upgrade can be paid by either e-cash or cash in the farebox! If this is available in the Bay Area, I would be able to pay $180 for a $5 ride value pass good on BART, Caltrain and all Bay Area buses. But of course, this is "Mission Impossible." With the discontinuation of BART Plus acceptance, riders will need to buy individual bus passes on their Clipper Cards. The only way to make it happen is, MTC needs to absorb all transit systems financially.